In addition to being a scientist, teacher, environmentalist, and California State Parks supporter, Edith Purer was an artist. Here are even more possibilities of "thousands of words." One of her lovely paintings is reproduced at the bottom of the web site and clearly demonstrates the dual nature of Edith Purer. Although it does not appear that she studied deserts professionally as a ecological scientist, she did collect some plants in the San Diego Desert, and she studied the desert through the medium of art. Her painting had an ecological aspect to it by having painted a native plant in the foreground. 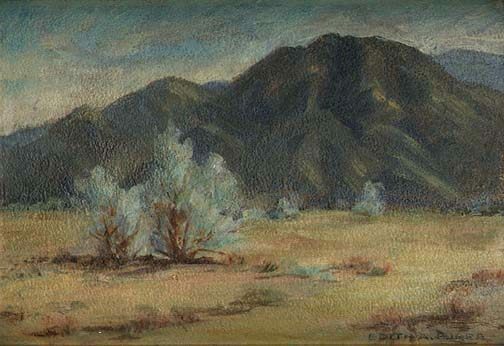 We know that her painting of the beautiful desert landscape scene dates to about the 1930s. It was painted at one of our most beautiful California State Parks, apparently at Palm Canyon in Anza Borrego Desert State Park. Edith Purer was born in 1895, so she would have been about 35-40 years of age at the time of the painting. Edith was a unique individual as she wsa both a scientist and an artist, something found in only a very few people. It is reminiscent of Robert Stebbins, a noted herpetologist-scientist and emeritus professor at UC Berkeley, but also a painter of desert landscapes and the reptiles that live there. Or Joel Hedgpeth, a marine biologist, who also draws sea spiders, plays a harp, and writes poetry. It is rare indeed, when science and the arts merge together, but it is what is needed today, and it occurred in Edith Purer as she was one of those rare individuals of California History during the Depression Era of the 1930s. 1936. Plants of Silver Strand Beach State Park, San Diego County, California. A Visitor's Handbook. 1939. Ecological Study of Vernal Pools, San Diego County. In: Ecology 20: 217-229. 1942. Plant Ecology of the Coastal Salt Marshlands of San Diego County. In Ecological Monographs 12: 82-111. 1933 to 1938. Twenty-one letters to the Botany Deparment at Harvard University. Anza Borrego Desert State Park?